I think you have to fill the empty space under the ground. That's the behavior they have jumping up and down rows of ? blocks and bricks. 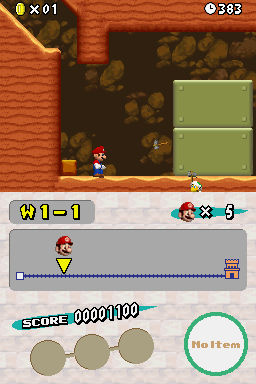 The hammer bros are only used on 1 level in the original game, which does happen to be a desert level, but both of the them have all 0's for sprite data so it wouldn't matter. I think the problem is that they have to be in an area with only three rows of blocks. How about the ones that spawn at midpoint or beginning of the levels? Yeah, there are those, but I meant hammer bros that are there every time you play the level. Thank you! They actually stop if there are 2 tiles between him and the bottom of a 16x16 block, not the bottom of the view. Does the 16x16 block under that have to be empty? Edit: Nope, he just wont jump down below the crease of a 16x16 block. Interesting. I set him up close to the top of a block, and it watched it for a little bit. It seems like they don't like jumping up and out of blocks, either. So I guess its not a good idea to put a hammer bro in a place which is 3 or more blocks higher?